Starting GPS Co-ordinates: N50 99' 50" W001 22' 10"
Finishing GPS Co-ordinates: N51 00' 20" W001 21' 70"
Make sure to turn LEFT here! The UCR we have called Little Woodcote Lane (if you know its correct name, please leave a comment at the bottom) starts where it leaves a country lane on a bend near Little Woodcote Cottage. Throughout, it is a nice, wide lane and offers a solid earthen surface that in places has been patched up with builder's rubble, and as such it is incredibly easy going. Heading generally northwards, the lane twists along a field boundary, and then turns quite sharply to the north-west as it plunges into a copse. 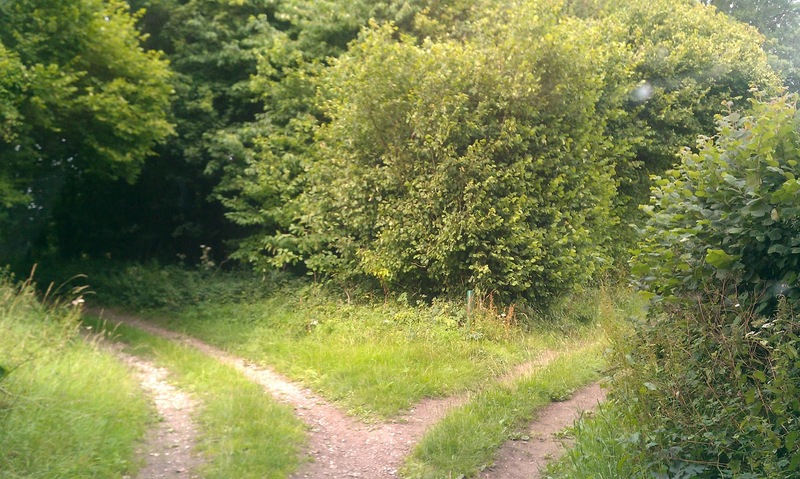 At this point, as the photograph illustrates, be sure to turn left as the track on the right is not a byway and ends after around 50m. In this area some retard has also decided it was a good idea to dump a load of used tyres. The mentality of this banal behaviour really does escape belief, but it is unfortunately a fact of life. Signs at each end of the lane, however, give details of the police's ongoing investigations into fly-tipping in this area, which is reassuring. Whilst in the copse, the lane twists sharply 90 degrees alternatively left and right for a total of four times, and then ends where it meets Belmore Lane. This is quite a nasty junction as it is difficult to see traffic approaching from the east, so take care. A good lane, if only it were longer.